Steward was featured in a three-minute segment on KSDK after 'Manchester By The Sea' won big at the Golden Globes. 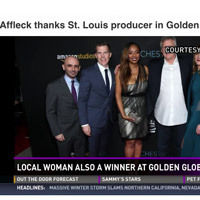 Webster University alumna Kimberly Steward was called "one of the hottest young producers in Hollywood" in a Jan. 9 segment on NBC affiliate KSDK after her film "Manchester By The Sea" won several honors at the Golden Globe Awards. The film's star and Best Actor Award winner thanked her and others in his acceptance. The three-minute segment also has audio of Steward, who graduated with a degree in broadcast journalism in the School of Communications in 2003, explaining how brief background appearances of the St. Louis Blues hockey team also appeared in the film. Read more about Steward's career, the experience of having her film premier to reave reviews at the Sundance Film Festival, and the impact of her Webster education in this Webster story from March 2016. Watch the full Jan. 9, 2017, KSDK segment below or at this link.